Japan's pensions and health care systems may be the rocks against which the LDP smashes to pieces. Last year, Abe Shinzo's failure to respond quickly and decisively to reports of missing pensions records doomed his faltering government. Now, under Fukuda Yasuo, the government is still struggling to account for missing pensions records and is reeling from public criticism of its new health care system for citizens over 75 years old. The LDP, meanwhile, stands at the brink of a brutal, potentially irreconcilable debate over whether to raise consumption taxes to finance the pensions system. As a result of this struggle to decide how Japan will provide for its burgeoning elderly population as the population shrinks as it ages, Japan will find its regional and global influence limited as governments are forced to focus on "livelihood" issues and devote the government's scarce resources to fixing the health and pensions systems. 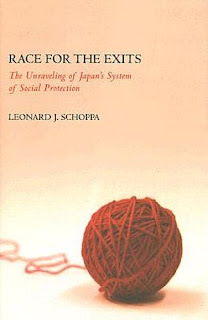 Leonard Schoppa, a political science professor at the University of Virginia, provides a useful explanation in Race for The Exits: The Unraveling of Japan's System of Social Protection (Cornell University Press, 2006). Professor Schoppa's thesis starts from Albert Hirschman's concepts of exit and voice. Hirschman argued that members of a social organization, if dissatisfied with the organization, have two choices in responding to their dissatisfaction: exit, whereby they leave the organization entirely, or voice, whereby they make their grievances known and work within the organization to fix the problem. Exit, however, can play an important role in bringing about change by signaling to decisionmakers that they have a serious problem on their hands. In looking at Japan's contemporary economic problems, Schoppa suggests that Japan's problem is that citizens and businesses have a moderate amount of exit options, enough to encourage some who are frustrated to exit but not enough (until recently) to signal to Japan's leaders that there is a problem. Moderate exit options also diminish the power of voice, by shrinking the number of dissatisifed members of society who might otherwise have exercised voice and mobilized for change. Schoppa looks in particular at the decisions made by two actors in Japanese society: women and companies. He argues that the postwar "convoy capitalism" system's welfare provisions rested on sacrifices made by these actors. Firms agreed to protect their core workers and offer them generous benefits upon retirement. Women left the workforce to marry, raise children, and eventually care for aging parents and in-laws. Both sacrifices enabled Japan to emerge as a "welfare superpower" without busting the government's budget. The system worked so long as Japan was kept in its postwar homeostasis, its economy relatively closed to the world, its firms restricted in their exit options and women pushed into and confined to household roles. It could not survive the transition to a globalized economy in which success depended more on openness. Accordingly, the task facing Japan's leaders is less the refurbishment of existing welfare institutions than the wholesale construction of news ones in which the Japanese state plays a much larger role than before, because firms and women are less willing to bear the bulk of the responsibility for welfare. In the case of women, the shrinking population problem, considered a consequence of decisions by Japanese women to not get married and to not have children, was similarly difficult to detect, and the government's response was similarly handicapped by limited exit options. What's needed are new measures that enable women to both remain in the workforce and have children. Working mothers, however, have exit options in the form of giving up work to become full time mothers or giving up motherhood to work fulltime. The result, argues Schoppa, is an insufficient number of working mothers to exercise voice and demand more support from the government. To fortify his argument, Schoppa points to two cases in which the government was quick to reform, cases in which there were either plentiful or no exit options: the LDP's decision in the early 1990s to create a new eldercare system and the big bang financial reforms introduced in the 1980s and 1990s. In the former case, Schoppa argues that women in particular mobilized in support of more eldercare provisions because "with elderly relatives...women have no way out." Accordingly, they appealed to the government for help with providing for the elderly. On financial reform, firms became able to raise cheaper capital in other financial centers, diminishing the power of banks and the Ministry of Finance. The extent to which Japanese firms opted to exit made clear to both the banks and MOF that the firms were fleeing to escape the high cost of capital domestically, and both shifted accordingly in response. But how long can this situation of moderate exit options persist? How much longer are Japanese firms willing to tolerate the high domestic costs that come with preserving the remnants of convoy capitalism? Is there a limit to their forbearance? Are Japanese firms silently abandoning the Japanese system by embracing ever increasing numbers of non-regular employees (part-time, temporary, or dispatched workers)? There is no doubt that this shift is underway. The report on the composition of the Japanese workforce by type of employment compiled by the statistics bureau of the ministry of internal affairs and communication — available here (Excel file) — shows the inexorable rise of the non-regular Japanese worker. In February 1988, regular employees constituted more than 80% of the labor force. Temporary workers provided by haken gaisha didn't exist. The number dipped downward during the 1990s, falling just below 75% in 1999. From the 1999, the decline hastened, falling below 70% by the end of 2002. The average figure for January-March 2008 is 66% regular staff, 34% non-regular staff. There are now reportedly 1.45 million dispatch workers and more than 10 million part-time workers (the number has fluctuated above 10 million since 1999). With this shift well underway, it is little wonder that Japanese politicians and citizens alike are concerned about the growth in inequality. So why aren't these new permanently temporary workers using voice to demand the government's help, given that they have few or no exit options? This points to a deficiency in Schoppa's book, namely, voice is comparatively underexplored. Is the weakness of voice simply the result of some choosing to exit, thereby limiting the political clout of those who remain? Or do actors find voice options less attractive than exit options for other reasons? Do actors opt for exit because they convince themselves that you can't fight city hall (or Nagata-cho, or Kasumigaseki)? Is it a matter of lack of organizational skills or resources on the part of those who want the system changed, as opposed to those who want to protect their privileges under the existing system? Alternatively, could actors have opted for the wrong voice options, choosing for example to work with the LDP instead of exercising voice by working to see the LDP defeated by an opposition party more sensitive to their needs? I find this unsatisfying and suspect that the problem may not just be the strength of reactionary elements — cited by Schoppa as an argument made by some political scientists — but a sense of resignation and powerlessness, even among corporate elites. Accordingly, Schoppa's account is an important contribution to the discussion of why the Japanese government has struggled with reform over the past two decades, but it leaves a number of unanswered questions. Nevertheless, I share Schoppa's bleak assessment for Japan's future if it fails to act now. The danger, he suggests, is that if these negative trends are not addressed now, they will lead to a downward spiral – a "race for the exits crisis" — that will result in "a steeper fall in fertility rates, high levels of emigration, a collapse of confidence in government bond markets, and capital flight." (206) At the center of Japan's problems is the central government's massive debt; the longer it persists, the greater the likelihood that the government will be handicapped in its efforts to provide a system of social protection desired by Japanese citizens. In order to save Japan from this crisis, he looks to its political leaders — and finds them wanting. He spoke of the promise of Koizumi Junichiro, but ultimately writes his government off as disappointing, having failed to provide a compelling vision of a new system. "What Japan needs," he says, "is a political entrepreneur who can sell the public on the attractions of an alternative system that can provide social protection as well as growth, one that is clearly superior to a system of convoy capitalism that is headed toward collapse." Surveying the contemporary political landscape, it is still difficult to see how this political entrepreneur might be. One possible part reason why there haven't been much "voice" yet from part-timers and dispatch workers could simply be that it is a fairly new large-scale phenomenon. Most people stuck in that life (I'm a temp worker myself) aren't yeat old enough, and haven't been stuck for long enough to react in a coordinated, visible manner. The first larger group is "the lost generation", and they're the ones that are now showing very low birth rates, political apathy and a lack of societal commitment; reactions I would interpret as a form of "exit". And for some young people, the concious choice to drift into temp jobs and arubaito is probably a way of leaving the (perceived) suffocating lifestyle of salaried workers as well. Another excellent review...which means I'll add this one to my reading list too. Unfortunately, I too have a very bleak view of Japan's future. Seems that historically, Japan has been able to make great changes at the last possible minute, but it doesn't look good this time. Women have exited in Japan. Politics has painted their "voice" as something leftist and foreign. It is not Japanese. Thus, by being pushed aside, Japanese women have had a quiet and determined revolution. It must be the only country where mothers counsel their daughters not to get married or marry a foreigner. Japanese women have opted out rather than fight it out. The inability of Japanese politics to see this coming, to see the anger in the women around them is not unexpected. The worlds of men and women evolved separately in postwar Japan. Modernity did not need everyone working together as a family unit on the farm. This disconnect is an extremely dangerous. Men in Japan interpret this as a security problem, where they must demonstrate that they can defend their women. Whereas women define the problem as societal, but have given up trying to change the social and work cultures. Unfortunately, it is men who make the political decisions. I knew the elder care issue would blow up this spring, after listening to my Japanese girlfriends who had to care for their parents. They were complaining about the change long before it occurred and I could see a political opportunity in the making. American women complained (and still do) but Japanese women appear to have just given up and moved on. I think the problem with the waiting-around-for-a-charismatic-white-knight strategy that Schoppa and others wish for is that it's exceedingly difficult for a political entrepreneur to succeed in Japan. With their restrictions on advertising, door-to-door canvassing, and even blogging, it would be difficult to make Japanese election laws more incumbent-friendly than they already are. On the other hand, I think Koizumi and Ozawa have proven that there is a lot of potential for acquiring a voter mandate for substantial change, once you can at least get to the position of party leader. With respect to women's issues, if Ozawa started making a lot of noise about workplace equality, subsidized childcare, etc. he could possibly reverse the party gender gap. The problem though is, the DPJ already does very well in urban districts where most working women presumably reside, so maybe it's not the big prize - it could perhaps be an opportunity for Fukuda (or... the second coming of Koizumi?) instead. "It must be the only country where mothers counsel their daughters not to get married or marry a foreigner. " Hirschman's "exit, voice, loyalty" paradigm is difficult to apply in practice, because you never know in advance what amount of exit options will be optimal for achieving your goal. It's pretty easy to envision a situation where moderate exit options are the best. After the fact, it just becomes hindsight. In terms of Japanese women, I think we have to look at more than their exit options. When the lifetime employment and seniority pay systems were in full effect, and inequality was low, being a housewife offered a lot of security. Now, with inequality and job insecurity on the rise, housewifery doesn't look like such a great life choice.